Many scientists & physicians have expressed their concerns regarding the adverse health effects of electromagnetic fields. “I believe that man-made EMFs, especially dirty electricity, are chronic stressors and are responsible for many of the disease patterns of electrified populations” – Samuel Milham MD, MPH – Medical epidemiologist in occupational epidemiology. “Radio frequency radiation and other forms of electromagnetic pollution are harmful at orders of magnitude well below existing guidelines. Science is one of the tools society uses to decide health policy. In the case of telecommunications equipment, such as cell phones, wireless networks, cell phone antennas, PDAs, and portable phones, the science is being ignored. Current guidelines urgently need to be re-examined by government and reduced to reflect the state of the science. There is an emerging public health crisis at hand and time is of the essence.” – Magda Havas, PhD – Expert in radiofrequency radiation, electromagnetic fields, dirty electricity and ground current. 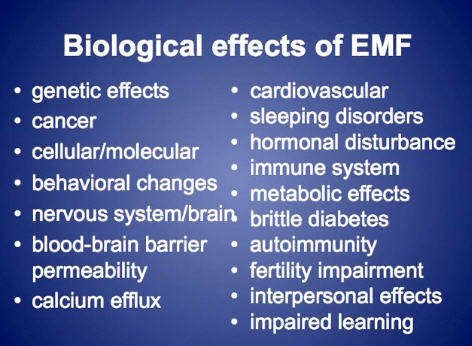 “Cells in the body react to EMFs as potentially harmful, just like to other environmental toxins, including heavy metals and toxic chemicals. 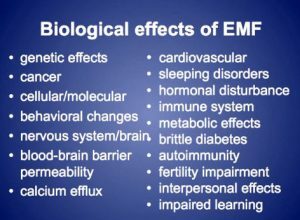 The DNA in living cells recognizes electromagnetic fields at very low levels of exposure; and produces a biochemical stress response. The scientific evidence tells us that our safety standards are inadequate, and that we must protect ourselves from exposure to EMF due to power lines, cell phones and the like, or risk the known consequences. The science is very strong and we should sit up and pay attention.” – Martin Blank, PhD – Researcher in Bioelectromagnetics; Author of the BioInitiative Report’s section on Stress Proteins. Thankfully there are ways to protect yourself from adverse health effects of electromagnetic fields. Beneficial Environments has solutions to reduce your everyday electromagnetic pollution. We can also carry out electromagnetic surveys in your home, clinic or office.